espoo: Which Bible Character are you? 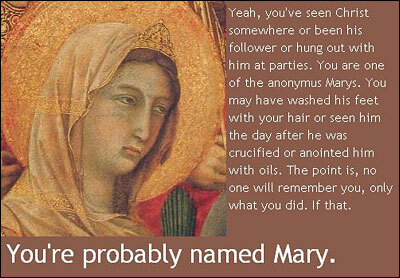 You're probably named Mary. Or John, if you're a guy. In any case, no one really remembers you. 326 other people got this result! This quiz has been taken 3122 times. 11% of people had this result. You're God. Congratulations on, um... being God. 329 other people got this result! This quiz has been taken 3064 times.